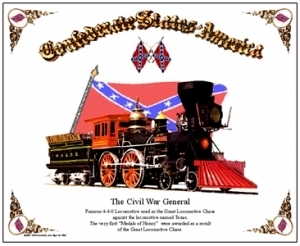 The Great Locomotive Chase of the Civil Was resulted in Americas very first Medals of Honor. She can be seen in restored condition (by the L&N RR), in Big Shanty, GA. Mouse pad featuring The General, famous steam locomotive of the Civil War Great Locomotive Chase. Tin sign featuring The Confederate steam locomotive The General, made famous in the Great Locomotive Chase. She can be seen in Big Shanty Georgia. Fess Parker stared in a Disney movie of same. Resulted in Americas first Medals of Honor. 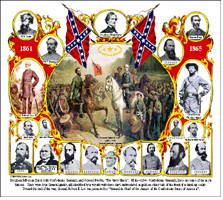 Mouse pad featuring CSA President Jefferson Davis and several of his finest Generals and one Major. The CSA had 425+/- Generals of four ranks. 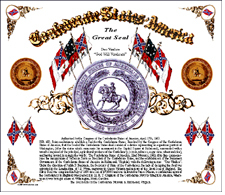 Mouse pad featuring the Great Seal of the Confederacy and verbage on where and who made it and how it was smuggled into the CSA.